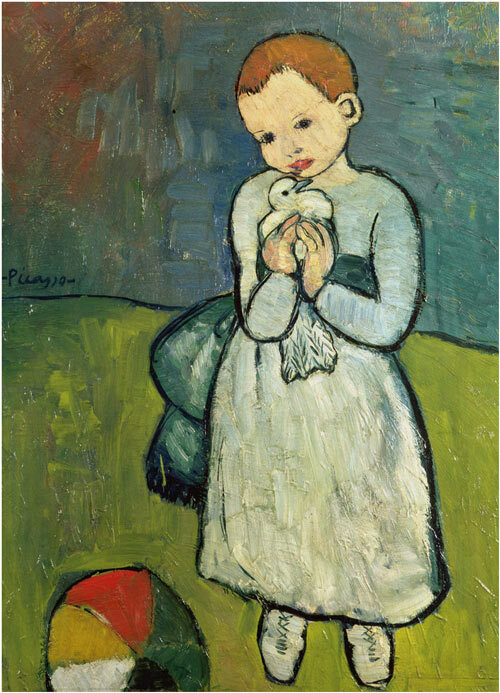 Pablo Picasso, Child With Dove (1901), oil on canvas, 54 x 73cm, National Gallery, London. We’re unexpectedly busy in the office (rubbing your eyes because of the shock), so I’m afraid this has to be brief. We simply love this Picasso: not abstract, just beautiful. It’s also housed at the National Gallery, so go and see it! Tags: Child With Dove, London, National Gallery, Pablo Picasso. Bookmark the permalink. Part of my visual library. I hope it will not leave the country, as seems likely. Indeed, we need to cling on to it tightly like the girl above – but not too tightly, we don’t want a Lennie Small situation on our hands.